individual organs to natural health and wellness. Paul Schmidt who was an engineer practicing alternative medicine and bioresonance and received 300 patents for his resonant frequency therapy methods. ​Our Bioresonance center uses the Rayonex PS1000 machine that was developed with collaboration of many medical and alternative medicine practitioners around the World. 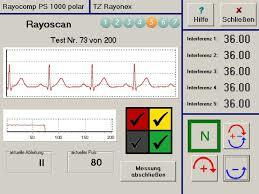 Rayonex is one of the oldest and most trusted companies using bioresonance patented frequencies for over 35 years. Bioresonance therapy by Paul Schmidt works on the principles of electromagnetic frequencies that tune your body or a particular organ to a perfect vibrational frequency, just like a piano or guitar to make your body healthy on a mental, emotional, physical and spiritual levels. Rayonex machine can harmonize your own DNA and substances like hair, nails, urine and blood as well as any allergens etc and also copy substances and make them into vibrational medicines. This function can be used for stop smoking or reduction of allergic reactions. Bioresonance machine scans and evaluates the body and organs. 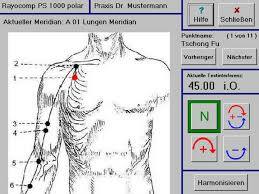 This picture shows ECG scanning and heart reaction of the body to the evaluation of the organs and body functions with electrodes attached to the chest area. ​Based on the results the system then balancing cession is done. Bioresonance energetically balances acupuncture meridians. Rayonex machine can activate and balance acupuncture points and meridians without the needles. All acupuncture meridians or separate Individual can be done together or apart. Scientists around the World work on the Rayonex machine software to help improve the system and patient's health. Click to see electromagnetic Chakra balancing. Information provided here is for educational purposes and not intended to diagnose, treat or cure. If in doubt see an MD regarding your medical condition. Bioresonance therapy is very popular in Europe and is used in hospitals and the military as well as reimbursable by medical insurance in some EU countries, but in the USA it is experimental therapy and non FDA approved, so seek a medical advice.